1 Bedroom Flat For Sale in Crewe for Guide Price £70,000. 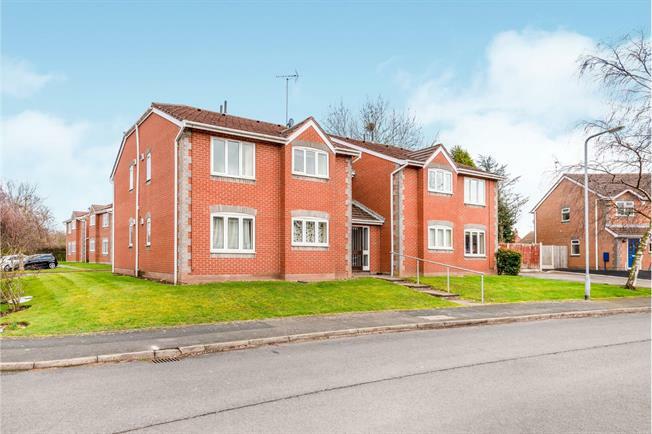 Well presented one bedroom ground floor apartment situated within a modern block located on a popular estate in the sought after village of Madeley. The accommodation comprises entrance hallway, lounge with open plan modern fitted kitchen, master bedroom with fitted wardrobes and a contemporary shower room. The property has an allocated parking space within the car park to the rear of the block. The property is being offered for sale with no upward chain. Front entrance door, storage airing cupboard, laminate flooring, wall mounted storage heater, light point. Double glazed window, wall mounted storage heater, light point. Range of modern units at eye and base level, roll edge work surface over housing a sink and drainer with mixer tap, tiled splash backs, electric hob and oven with extractor over, space for a fridge and washing machine, integrated slimline dishwasher, double glazed window, laminate flooring, light point. Double glazed window, fitted wardrobes, light point. Modern fitted shower room comprising corner shower enclosure, vanity wash hand basin, low level WC. Tiled walls, spotlights, ladder towel rail and extractor. Allocated parking space found within the car park to the rear.